This song is sung in the film, and the lyrics are certainly quite haunting, setting the tone for the action to come which follows the same pattern as the song: one death after another. Rene Clair directs this adaptation of the novel, which stars Barry Fitzgerald, June Duprez, Walter Huston, Louis Hayward, Roland Young and Judith Anderson among others. Though the film features a different ending than its source material and takes a few other liberties with the story, you can’t really go wrong with a whodunit crafted by Agatha Christie, so I went into it with high expectations. In the mysterious sense the film delivered, but some of the performances started out weak, which made the film a bit hard to get into. As the suspense of the story itself picks up, the performances seem to get stronger. Any creakiness felt in the beginning is lost as the culprit is hunted down and the party continues to lose guests under suspicious circumstances. Though the suspense picks up, the pace does not; the entire film is quite moderately paced, but it suits the film’s tone. One shouldn’t expect an action-packed or violent mystery film here. The film opens without any dialogue for nearly five minutes, which leaves the audience in the dark, much like the characters who don’t know what to expect when they are invited to an island full of complete strangers. A fantastic score composed by Mario Castelnuovo-Tedesco picks up where the silence left off and does a great job of elevating the film’s level of suspense, as well as its impact on the viewer. Amidst all of that anguish and suspense there is a bit of humor here, too. I found the ending (which I won’t spoil) to be pretty funny, and there are a few bits of very witty dialogue sprinkled throughout the film. In terms of DVD quality, the picture of the VCI release leaves a bit to be desired. It isn’t terrible, but it has a slightly worn appearance. The picture is clear enough to keep track of what’s happening and even clear enough for the viewer to see that the film is very well-constructed (especially in set design), but it could use a bit of restoration. The sound, on the other hand, has no major flaws. The special features are also decent, including biographies on each actor from the film as well as a short called “Twin Husbands” from 1946, which is a lot of fun. 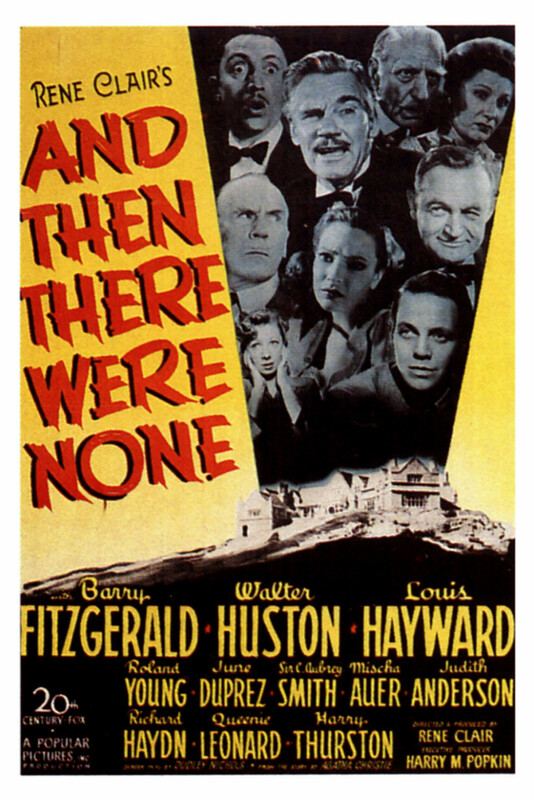 And Then There Were None didn’t grab me quite as much as I expected it to or hoped it would, but it’s still an enjoyable watch. I love this thriller. Along with Witness For The Prosecution, it is my favorite Agatha Christie adaptation. Great cast.